The New York Times Company announced this morning that it will be introducing a paid, metered model for NYTimes.com at the beginning of 2011. The publisher will offer users free access to an unspecified set number of articles per month and then charge users once they exceed that number. The New York Times says this will enable NYTimes.com to create a second revenue stream while still preserving its advertising business, for which digital now makes up about a quarter of its total advertising revenues. In addition, the company says, it will also provide the “necessary flexibility to keep an appropriate ratio between free and paid content and stay connected to a search-driven Web”. Through 2010, NYT will be building a new online infrastructure designed to provide consumers with a good user experience across multiple platforms. Once the metered model is implemented, New York Times home delivery print subscribers will continue to have free access to NYTimes.com. It remains to be seen if that will be the case. The company said more details regarding the metered model will be available in the coming months. Check out NYT reporter Richard Pérez-Peña’s take on his employer’s plans here. 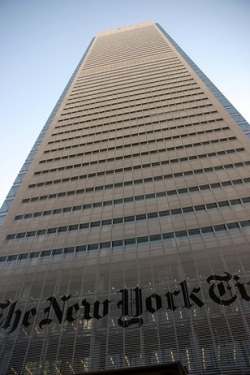 Last weekend, New York Magazine reported that the New York Times Company was close to announcing that the paper will begin charging for access to its website. They were right, and also about the fact that it would likely be a metered model like the Financial Times rather than a pay wall type offering like the Wall Street Journal (cough). Evidently, it’s hard not to see this announcement in light of Apple’s upcoming event, where the company is set to unveil its new tablet computer and a slew of content partnerships with major publishers, likely including the New York Times. What do you think about the NYT’s plans to start charging for access to its website articles? Do you think they made the right decision in turning to the metered model rather than a traditional pay wall or micro-payments based approach?